Includes everything except airfare and some meals. 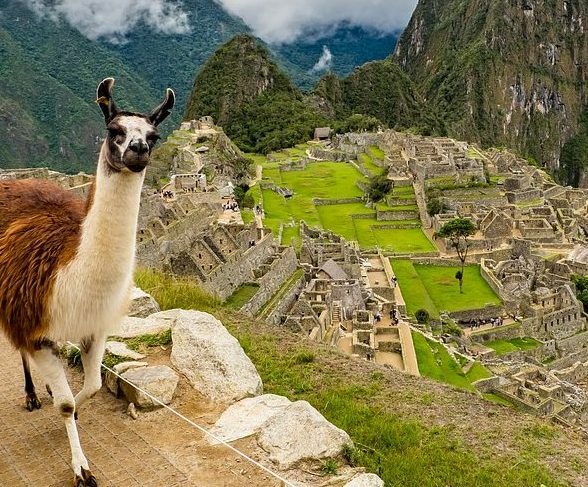 We’ll scramble over Incan ruins, make offerings to in a traditional ceremony, explore the historic city of Cusco, meet women weavers, and spend a day in the clouds at Machu Picchu! If you want “insider experiences” that are hard to arrange on your own, but you don’t like traditional group tours, this trip is for you. 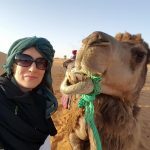 Each Women’s Adventure is a small group of fascinating women (no more than 8) who share a house & chores and do lots of walking or use local transportation in order to experience a more authentic local life. 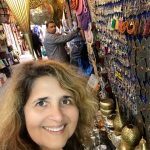 If you’re curious about other cultures and want to get to know people instead of staring at them through a bus window, these tours are for you. This trip will include a lot of walking, on rough terrain, at high altitudes. You’ll need a reasonable degree of fitness. However, for those with foot/knee pain, I am able to provide foot-friendly alternatives to some of the hiking and walking. It's best to remain flexible in Peru, and some of the logistics may change. But this is the itinerary I'm currently planning for us. If you're arriving today, someone will meet you at the airport and bring you to our meeting point. If you're arriving early, I'll help you find the right hotel and make sure you're picked up at the airport and taken there. 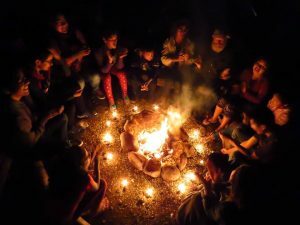 We'll all pile into a private van and ride together to our house in the Sacred Valley, where we will settle into our rooms and get to know one another. I hope we'll have time in the evening for me to teach you some travel tricks using Google Maps so we can all feel confident and secure as we explore the Valley. After an optional yoga class and a leisurely breakfast, we'll head to the nearby village of Urubamba for the day. 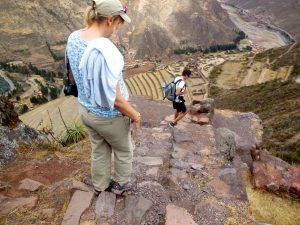 This day is deliberately slow-paced in order to let you acclimate to the altitude and soak up the incredible views and amazing people of the Sacred Valley. 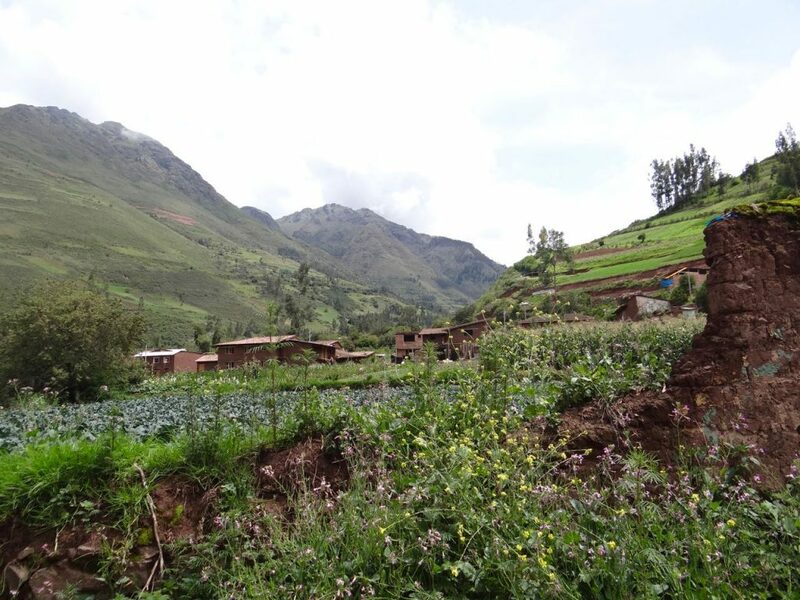 Urubamba is the heart of the Valley, where locals gather to trade homegrown vegetables in the Market or to enjoy an ice cream cone in the plaza. We'll dive right into the market, where you'll learn about local produce and people. I'll take you to my favorite café where you can relax with a coffee, tea, or juice in a lovely garden. 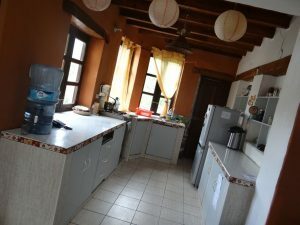 We'll also visit the orphanage that I work with; the kids will mostly be visiting extended family during their school vacation, but you can see the home and garden and meet whoever is available. We'll have a gourmet dinner in town at a beautiful garden restaurant before returning to our house on the mountainside for a relaxing evening. After an optional yoga class and breakfast, we'll take a 20-minute walk downhill to the Inkariy Museum just below our house. There you'll learn all about the people who have lived in this Valley, including the Pre-Incan and Incan cultures. This unique Museum has life-size dioramas that tell some surprising stories about the rituals, beliefs, and traditions of the Andean people. 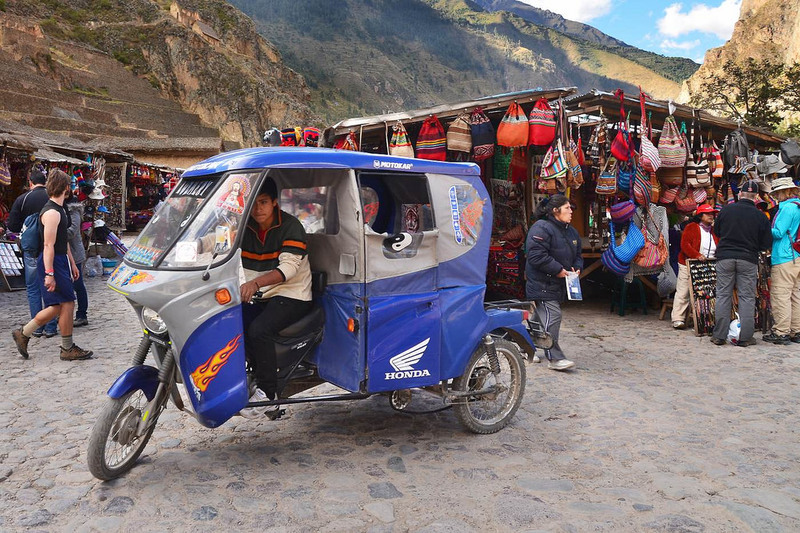 After the Museum, a van will take us to the village of Pisac. High above Pisac are trails where you can hike in the mountain air and encounter Incan ruins around every turn. You can set out on a truly strenuous and breathtaking hike or visit just the most dramatic sites and then return to the village by mototaxi to shop in the market and stroll the streets. In the evening, we'll have a traditional Despacho Ceremony of Gratitude and Healing. According to our guide "This ceremony links gratitude with happiness, health, and dreams manifested. This ceremony is also to acquire inner balance and inner peace and to remove anything negative. Despacho is to call upon the elemental forces and to enter into our own divinity." 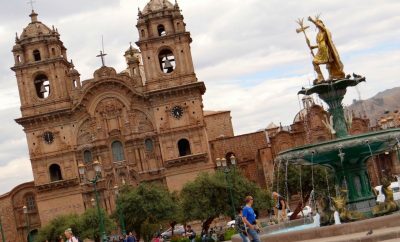 After breakfast, we'll head to Cusco, the city that was the heart of the Incan Empire and the seat of Spanish control in Peru. The city has a lot to offer, including museums, shopping, cathedrals, and hikes to surrounding historical sites. We'll decide together what we want to see and do, and perhaps split up into smaller groups for the second half of the day. Although Lima is Peru's biggest city by far, Cusco is its cultural center. 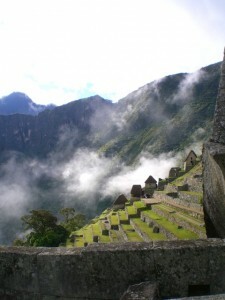 We'll return to our house in time to pack our overnight bags for our trip to Machu Picchu! 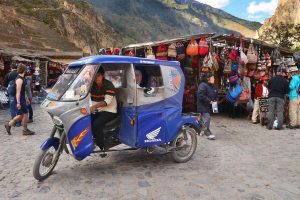 We'll leave early in the morning for the town of Ollantaytambo, a beautiful Incan city that is popular with tourists on their way to Machu Picchu. We'll be picked up by a tour guide who will take us high into the mountains to a remote village, where we'll learn more about indigenous life. 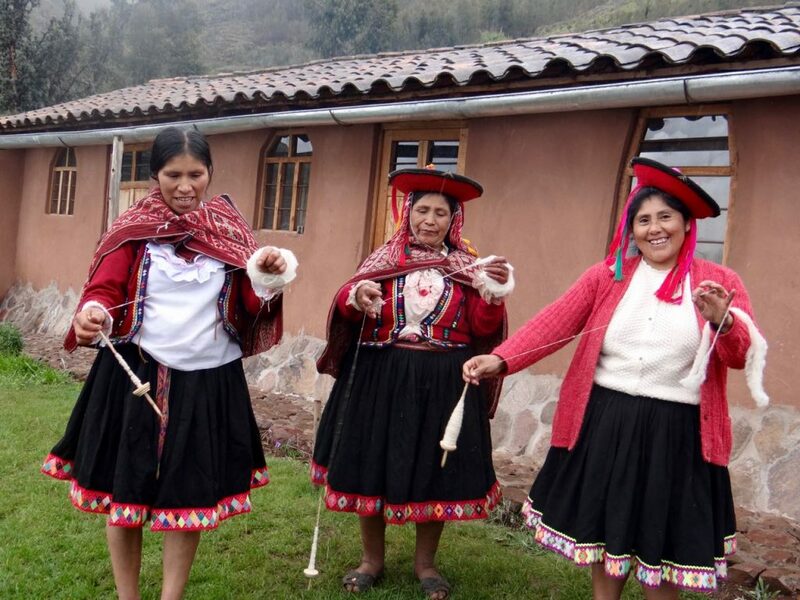 The women of the village will teach us how they spin, dye, and weave alpaca wool, and we'll each get to weave a bracelet of our own with the help of a local woman guide. This project is bringing respect and financial power to the women of the villages, and it's something I'm thrilled to support. We'll return to Ollantaytambo in the late afternoon and have time to explore the town and the ruins before we leave by train for Aguas Calientes. Aguas Calientes is a less interesting town than Ollantaytambo, so we won't spend much time there. We'll arrive late, sleep in group rooms in a basic but clean local hotel, and rise very early to head into the clouds by bus. At Machu Picchu, a guide will explain the ruins that we're seeing, including the Temple of the Sun, the Temple of the Condor, and other fascinating buildings. 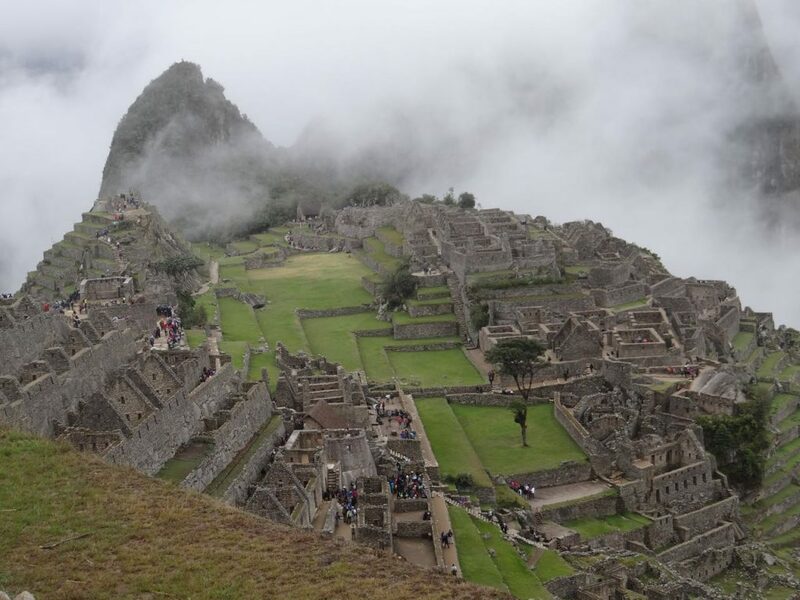 After the tour, you'll have free time to climb Huayna Picchu, hike to the Sun Gate, explore the ruins on your own, or find a quiet corner to meditate. At the end of the day, we'll return by train to Ollantaytambo and take a van home. Those who aren't going on the optional Lake Titicaca excursion will be ferried back to Cusco today to catch their flights home. The others will have a chance to sleep in, go for long walks, journal, and otherwise relax. 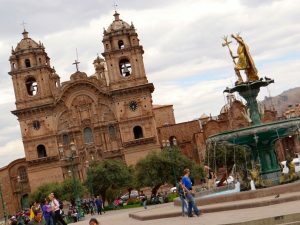 Depending on the departure schedule, I can also make arrangements to take people back to Cusco or Urubamba for the day to shop or explore. We'll go to Cusco to catch a very luxurious bus for the long ride to Puno. This is not a private tour — there may be other tourists on the bus — but we will have a guide. 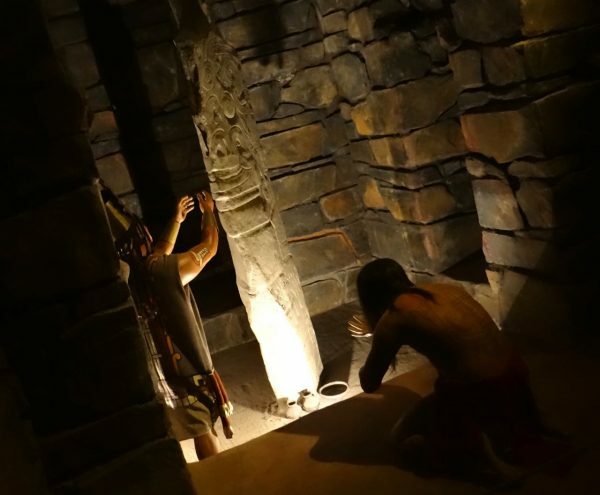 The bus will make stops at several interesting archeological sites along the way; past tours have included a cathedral decked out in gold, an ancient Incan settlement, and a small museum with Peruvian mummies on display. We'll spend the night in a simple hotel in Puno. A boat will take us to two of the islands on the lake, where we'll have a first-hand encounter with some of the most interesting and unique cultures on earth. The people here started building islands from reeds in order to enjoy the safety of the lake. They also build their houses, boats, and furnishings from the reeds. We'll meet them and learn about their way of life. We'll spend the night with local families in a homestay on one of the islands. This will be some of the least luxurious and most memorable lodgings of your life, guaranteed. We'll probably return by bus, but without all the stops along the way. We might also opt for a train, I'm still gathering information to compare the two options. Either way, we'll have a long travel day in a comfortable seat, relaxing and processing all we've seen and done, followed by an evening at home. We'll probably travel together to Cusco and those with later departures can enjoy the city a bit more before it's time to leave. If you set your expectations on "glamping" you'll be very pleased with our accommodations. It's a remote local house with solar systems, so we might struggle with wifi and hot water -- although reviews say the hot water situation is really good! Many days we'll make the 20-minute walk to the main road and then travel by collectivo (local transportation vans) to neighboring towns. However, a van option will be available for those who can't do the steep walk down or up the hill. The view from our patio is stunning. The living room where we'll relax together in the evenings. A cozy kitchen to prepare breakfasts. 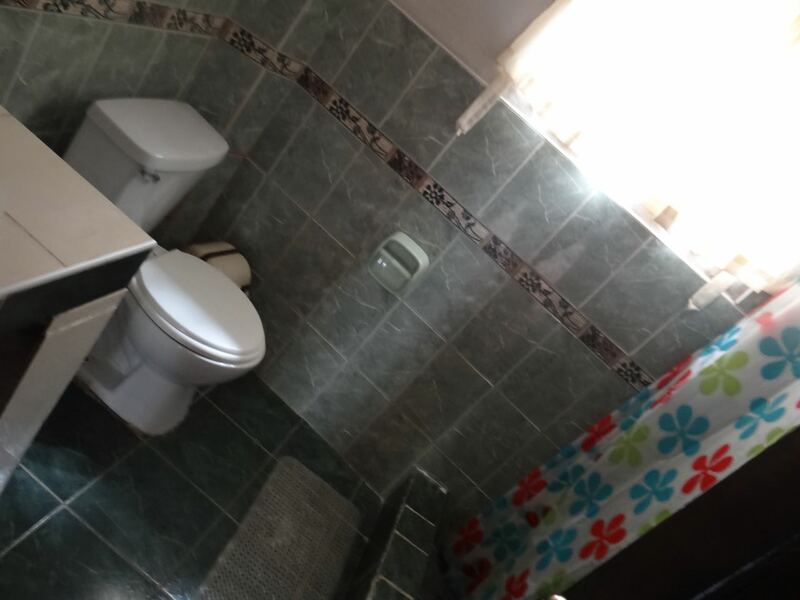 The house is rustic, but it has two completely modern bathrooms with showers and flush toilets. Bunk with your new girlfriends, or choose to upgrade to a larger bed or a private room. 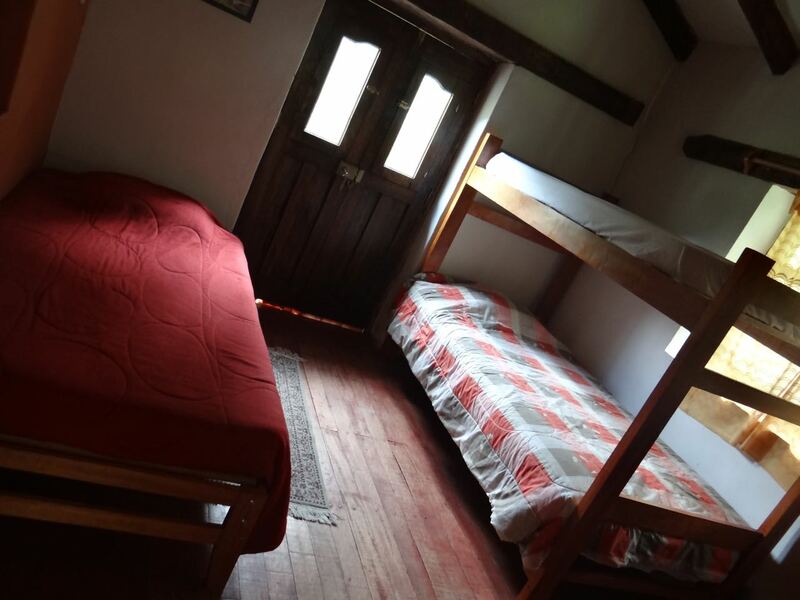 We'll spend one night in Aguas Calientes, at an inexpensive but clean hotel or rooming house, probably in group rooms. The specifics of that lodging are still being arranged. 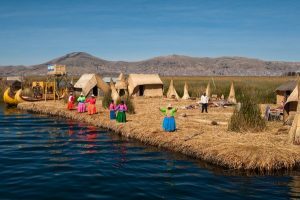 The optional lake Titicaca tour will include one night in Puno, again at an economical hotel or guest house, and one night in a homestay with locals on the island. Arrival Day: Monday, January 21, 2019 (before 6pm) * your flight may depart the day before Departure Day (without Lake Titicaca): Sunday, January 27, 2019 (any time) Departure Day (with Lake Titicaca): Thursday, January 31, 2019 (any time) I set the arrival day on a Monday in hopes that most people will actually be able to arrive on Saturday and acclimate to the altitude for a day or two. If several people are arriving early, I will come to Cusco and make myself available for the weekend. 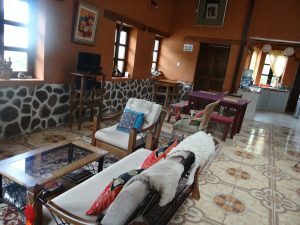 I can recommend several hotels there (Tierra Viva San Blas is my favorite, but I also love Apu Huascaran and it's slightly cheaper). If there are enough of us interested, I can rent a three-bedroom apartment for us and we can split the cost. What will the weather be like in January? Peru in January: Lush, green & full of wildflowers! Nicer than home, I'll bet. 😀 I chose January for this trip because it is one of the most beautiful months in the Sacred Valley. January is the peak of summer in Peru, and the height of the rainy season, but neither of those things delivery what you might expect. The Sacred Valley has a very dry climate overall (you will see lots of cactus there). During the dry season, the land can look brown and parched. But in January, all the flowers will be in bloom, and the hillsides will be lush and green. January has an average of 16 days of rain in this area, so expect a little rain every other day or so. Typically it rains lightly for about an hour in the afternoon and the rest of the day is sunny and lovely. Only occasionally is there a real downpour, and those rarely last more than a few minutes. You will want to bring a light rain jacket, and perhaps a small folding umbrella. Although it's summer, the weather is still cool at this altitude with highs averaging about 70˚F and lows in the upper 40s at night. Because the air is so thin, the temperature changes quickly throughout the day; you'll feel surprising hot hiking in direct sun, but if a cloud appears you'll feel chilly. Dress in layers and bring a lightweight day pack so you can always have layers with you. Warm pajamas are important, as night temps are cool and most buildings (including our house) don't have heating systems. I consider the places we'll be visiting to be among the safest in the world. (Although some areas of Peru are a bit sketchy due to lingering political differences and drug trade, we will be nowhere near those areas.) The U.S. State Department agrees, placing Peru in the Level 1 category (safest countries to visit). Cusco is full of tourists year-round (although January is much less crowded than other months). Like any tourist city in a poor country, it's best to keep your phone and valuables secure and be aware of your surroundings in Cusco, but I've never felt unsafe there. U.S. citizens can stay up to 90 days in Peru without a visa. You do need a passport that is at least 6 months away from expiration. If you are not a U.S. citizen, e-mail me and I'll help you research your situation. Since nothing is actually required, it's up to you and your doctor to decide what's right for you. Dogs are common and often semi-feral in Peru. I find them unpredictable and tend to avoid even making eye contact with them after being snarled and snapped at a few times. If you cannot resist interacting with the dogs, I highly recommend the rabies vaccine for you. 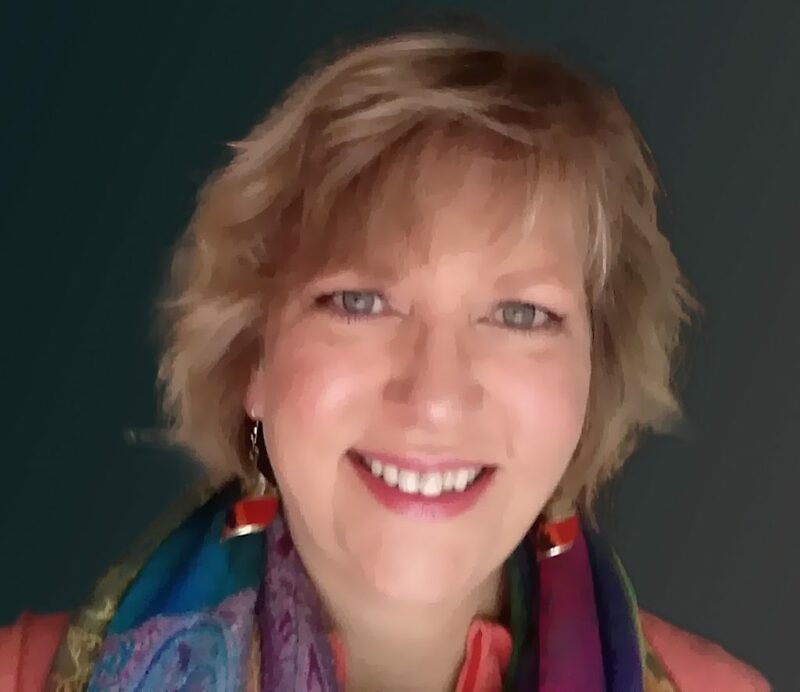 I will do my best to help you avoid restaurants and foods that might make you ill in Peru. The locals in Urubamba consider their water much better than most of the country, since it comes straight from the glacier. However, traveler's diarrhea is common in Peru. You might want to bring some Immodium and perhaps a "just in case" antibiotic from your doctor. Actual "altitude sickness" is very dangerous, even potentially fatal. Luckly, it is not at all common among casual tourists like us (it's a problem for mountain climbers who are ascending rapidly while overexerting themselves), but nearly everyone is affected to some degree by the altitude. If you are in reasonably good health, but not accustomed to altitude, you can expect to have a slight headache and feel very low-energy for the first day or two. (I remember that brushing my teeth made me so exhausted I had to lie down on my first day there!). Walking downhill isn't much of a problem, but it's best to take a taxi back up for your first couple of days. It's also good to avoid alcohol, not smoke, rest often while walking, and drink plenty of water. How well you'll recover your strength depends mostly on your health and genetics. People who regularly exercise to the point of breathing heavily and getting their heart rates up usually do very well. People who are somewhat sedentary but in good health usually do fine. If you've never been at altitude, though, you can't be sure how it will affect you since genetics play a factor. Don't worry, we will take it easy for the first few days and make sure everyone is comfortable and enjoying themselves. Your doctor can prescribe medication that might help with altitude if you want it. Ibuprofen is very helpful for some people. Staying hydrated and replacing electrolytes is helpful. The locals swear by drinking coca tea or chewing coca leaves, which are widely available, quite popular, and surprisingly mild. If you are a heavy smoker, very sedentary, carrying a great deal of extra weight, have uncontrolled high blood pressure, or have other lung or cardiovascular issues, you could be at risk of having real problems and this trip might not be suitable for you. Consider a trip where you stay at a hotel in Cusco, with access to oxygen and immediate medical care in case of a problem, rather than this one where we'll be in the countryside. According to industry research, the ideal time to buy an international flight is between 5 1/2 months and 90 days before you fly. The ideal time to buy a domestic flight is much closer to the flight time, between 3 months and 7 weeks before you fly. 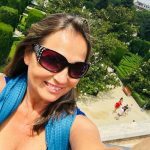 Personally, since I don't live near an airport that flies regularly to Peru, I like to purchase my international flight first, from any departure point where I can get a good deal, and then buy the flight to that departure airport later. That lets me shop for the best deals, and also spreads my airfare out over 2 months so I don't have to pay for it all at once. Kiwi.com is my favorite tool for shopping for flight deals, because it will let me assemble flights using unrelated airlines. However, in recent months their customer service hasn't been the best, so I suggest using the site to find the best flight combinations and then buying the flights directly from the airlines. 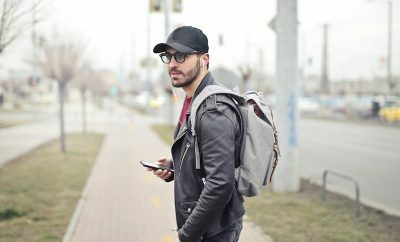 If you buy through Kiwi, make sure you also connect directly with the airlines to confirm your flight and learn about luggage costs, meal service, etc. before you fly. If you haven't flown recently, you should be aware that luggage -- even a carry on bag -- is often NOT included in flight prices now. It's frustrating, but you really have to research those costs before you buy a ticket. There is no place dearer to my heart than Peru's Sacred Valley. 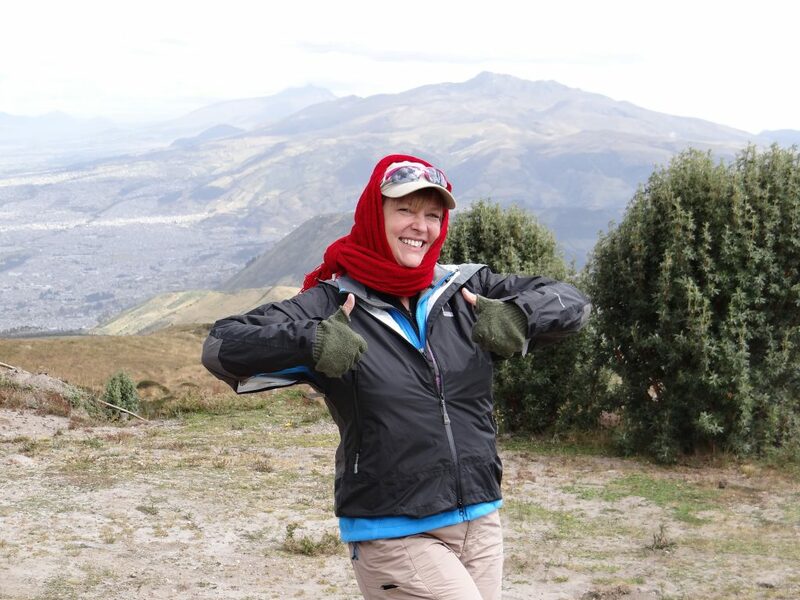 I serve as U.S. Board Chair to a remarkable orphanage in Urubamba, so I spend a lot of time in Peru. I'm eager to share this place and its remarkable people with you. At the end of the week, you can choose to stay for an optional two-day, one-night excursion to Lake Titicaca, where you’ll visit some of the most unique floating villages in the world — where everything, including the island itself, is built of reeds! Check out the Itinerary tab above for more detail. If you have the time, I highly recommend this add-on, priced at just $250 for three extra nights. Includes: Lodging, breakfasts, a few additional meals, all activities, guides, transportation, admission to Inkariy Museum, and touristic passes for the ruins at Pisac, Ollantaytambo, and Machu Picchu. Excludes: Most lunches and dinners (usually around $10 each), additional hotel stays before and/or after the event dates, gratuities, travel insurance, airfare to Cusco**. Important: We’ll be in a mountain location. Lots of walking is necessary, and some of it will be over rough terrain. 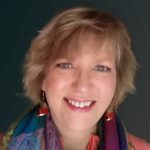 While I can offer some lower-impact options to hikes and transportation, I’m not able to make this particular trip viable for travelers who have serious mobility or breathing issues. We’ll also be at high altitude. 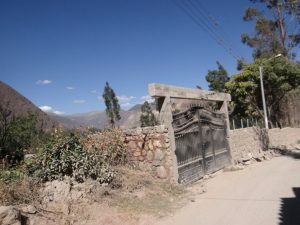 Urubamba (9,420 ft) is somewhat lower than Cusco (11,150 ft) but the altitude can be challenging at either location. If you’re not accustomed to the altitude, I recommend arriving a few days early and acclimating gently. I can recommend a hotel in Cusco for any budget! **Check airfares before you commit; airfare to Cusco can be quite expensive from some cities in the U.S.